Day 6.. Violet nails.. Well, to me that just means purple.. So a purple shade it is! I knew exactly what I was going for.. And I'm really glad I did.. I am kind of in serious like with this polish/combo now!! 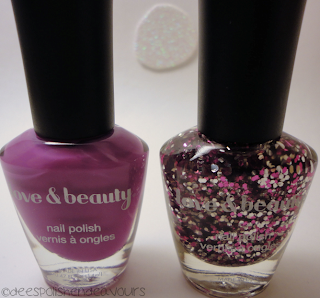 I have a few polishes from Forever 21, but all of them are.. ehm, somewhat disappointing.. I was a bit apprehensive when I tossed these in with an order a month or more back.. Then they arrived and mind = blown! 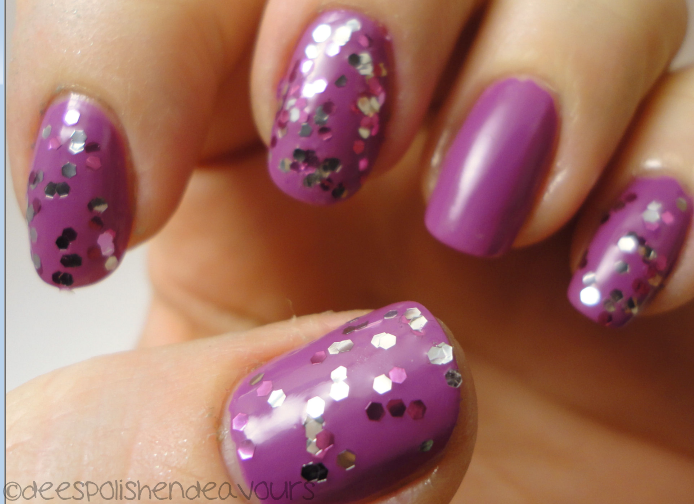 The polish is exceptionally opaque and the glitter polish just gives it an extra kick. Love these two together! I actually ordered them to do the glitter sandwich mani, as all my other F21 polishes are extremely sheer, then of course I get these gems instead. Love!